My wife and I took a bike trip to Himachal and back. Starting from Mumbai, it was a great 25 day and 5500km trip. On the second day, when we reached Udaipur and into our Hotel, we opened our luggage. She had her strolly and I had mine. And the bike had his. That’s about 10 bungee cords three times a day. So, we gave away almost two thirds of our stuff to the room waiter, with the bags. We went down and bought two cloth bags, plasticated it and continued. At Oleg’s I did the same. Reduced a third. Ofcourse the route dynamics are different and so is the travel demand. Stats: Now medicine is a major, electronics is next and then clothes. Earlier I was carrying enough food to feed Russia! So the food and the clothes went. Meds have to be consumed to reduce weight and electronics – cameras and spares and wires and wires of wires and their wires will stay till eternity. Over prepared. There’s a mobile, GoPro, GoPro Sessions and Sony Alpha D6000. I can easily open an event company here and retire! The Wedding Photographer from India. Sounds nice! 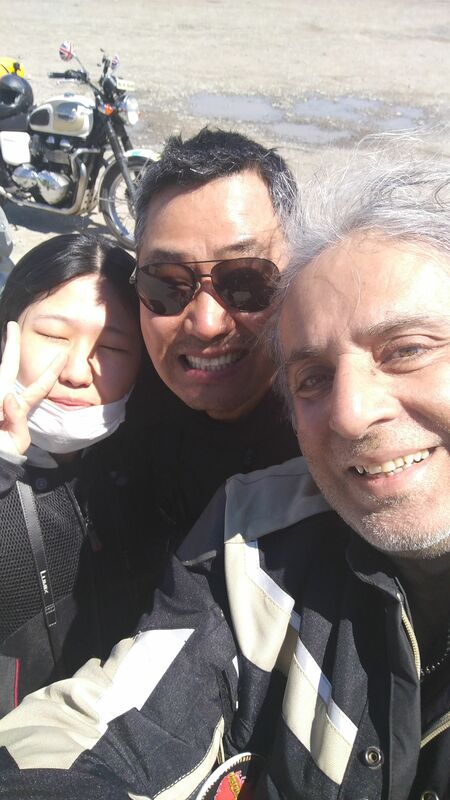 I met a Korean couple along the way on a Suzuki. They are going to Moscow as well, so I guess we will ride together. Ofcourse he doesn’t speak English and I haven’t spoken his language in a long time. I rode into Khabarovsk, the jewel of the Amur quite peacefully. 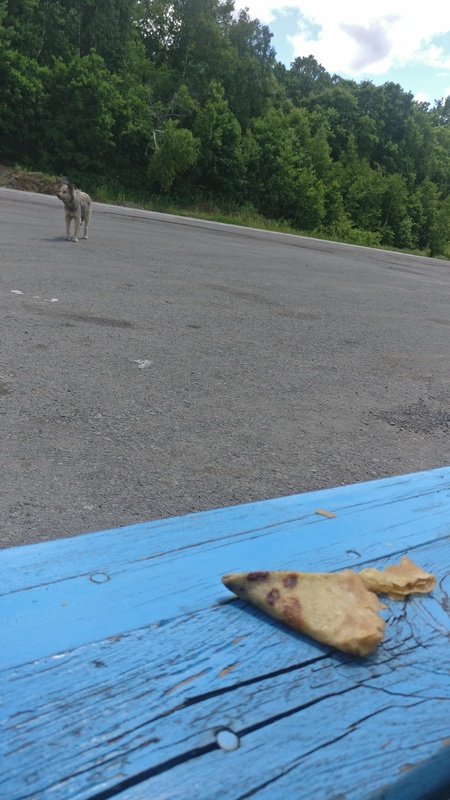 A friend of Oleg had packed pancakes and these I shared with a canine friend at a free pee stop. While language is a problem, still the people are keen to improvise and communicate. The mobile top up, the fuelling. I can’t show Google translator all the time. So we make it work and it does. Russians are extremely friendly and warm hearted. Earlier when I stopped for strawberries, I asked for one berry that I could chomp on without alighting. The fruit seller understood my predicament and sold me one fat mama. Then, when I finished it, he gave me a handful of smaller ones, so I could hold them. And I am certainly not his regular customer. That’s social generosity. The fuel pump principle is to ride to the pump, say 95 Octane and put the pump funnel into the tank. Then, I have to walk to the manager inside and put down an amount after which she will let you draw that much. In my case I always need a top-up, so can’t estimate. Now this is a difficult manoeuvre for me with my gear on, etc. So the manager once saw me doing it and asked me to fill up and then pay. Nice. Ask for directions and it’s a community thing. All kinds of opinion comes your way. Once a four-wheeler stopped bang in the middle of the traffic so that I could see him and his hand signal. Ok, the Pork Chops are over. Goodnight! Nice content and photos. Thanks a lot for sharing. Love the fee of community you describe. Most people are kind. It’s power and money that divides. It seems customery to have the Udaipur manoeuvre on the Second day! Sure you are feeling lighter, free..er and happier! Food enough to feed entire Russia : awesome line. Keep up the good work, looking forward to your next update. Loved your experience. Hope to make something of my own. I too have written an article about the best sites and things to do in Udaipur.